Part of our range of lockers, we offer a variety of wire mesh lockers that are ideal for industrial use. Manufactured from strong and durable steel the wire mesh can be supplied in a bright zinc plated or a powder coated finish. 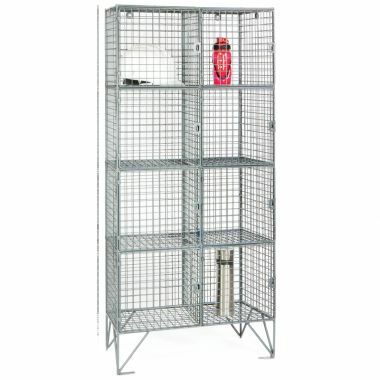 Simple and effective, the wire mesh storage lockers can be supplied in several standard sizes, varying from single door models up to twenty compartment wire mesh lockers. 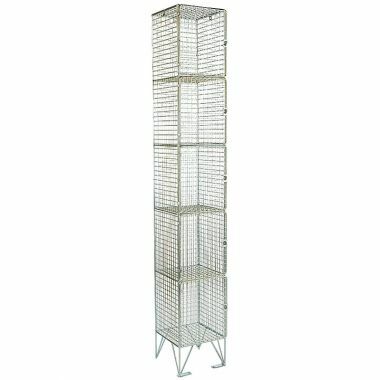 The wire mesh lockers can also be produced to bespoke sizes if required to suit your individual storage requirements. Ideal for storing equipment and personal protection equipment, PPE, the wire mesh construction allows contents to be clearly visible and allows for efficient levels of airflow. 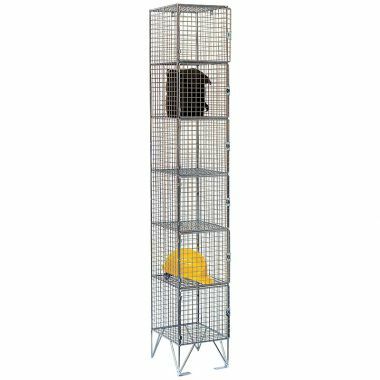 Robust storage lockers, the wire mesh frames are designed for use within industrial environments and are able to cope with the rigours of demanding and repetitive use. Each standard model is supplied on a set of legs to keep the lockers up off the floor to assist with hygiene. 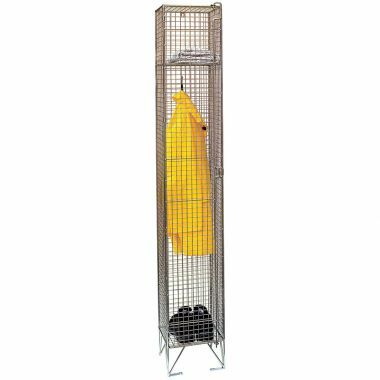 The wire mesh construction allows air to flow easily to the contents, so if clothing or PPE is stored, the lockers help to prevent the build of foul odours. Due to contents being clearly visible, the wire mesh lockers help to reduce the risk of theft within a business as items can be easily seen. Bright coloured zinc plated finishes help to protect the wire mesh and prevent it from the effects of rust or corrosion. Powder coated mesh lockers can be used for colour coding practices, separating different storage lockers for different departments for example. 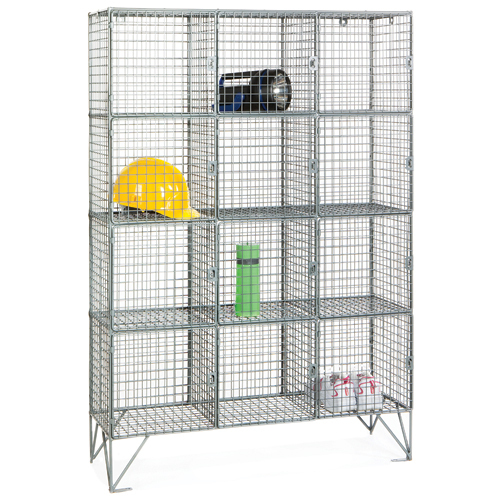 Choose from a wide range of standard sized wire mesh lockers or feel free to contact us today with your individual requirements as bespoke solutions can be manufactured on request. 1. 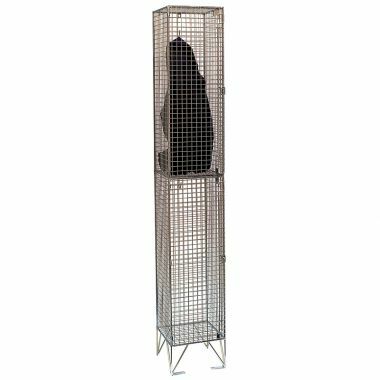 Wire mesh lockers help to prevent theft by making their contents clearly visible at all times. Ideal for the retail industry the mesh storage lockers allow contents to be clearly seen, preventing goods or products from being hidden from sight. The wire mesh also allows the contents to receive an efficient level of airflow, so that clothing or PPE does not build up strong odours. 2. 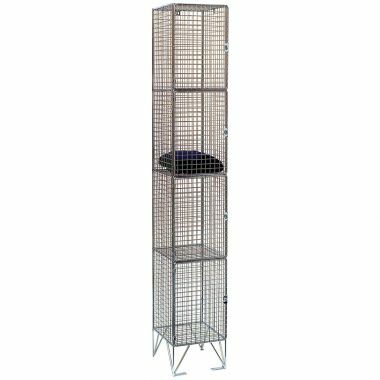 The wire mesh lockers can be produced in any of the standard sizes, with compartments spanning from single to twenty compartments models. Bespoke steel mesh lockers can also be manufactured to suit your individual requirements. Enquire today to see how G-Force Europe can help with your storage requirements. 3. 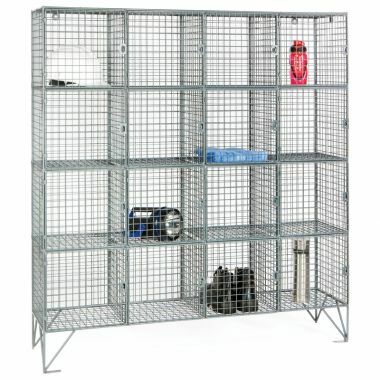 Bright zinc plated and powder coated wire mesh lockers are designed to last. The zinc plating and powder coating helps to protect the steel and prevent it from rusting and corroding, ensuring that the wire lockers are well protected and able to cope with the rigours associated with industrial environments.